Love these!! Soft and cuddlh! Just what I was looking for! Drift off to sleep on this plush pillow pair from Amrapur Overseas. 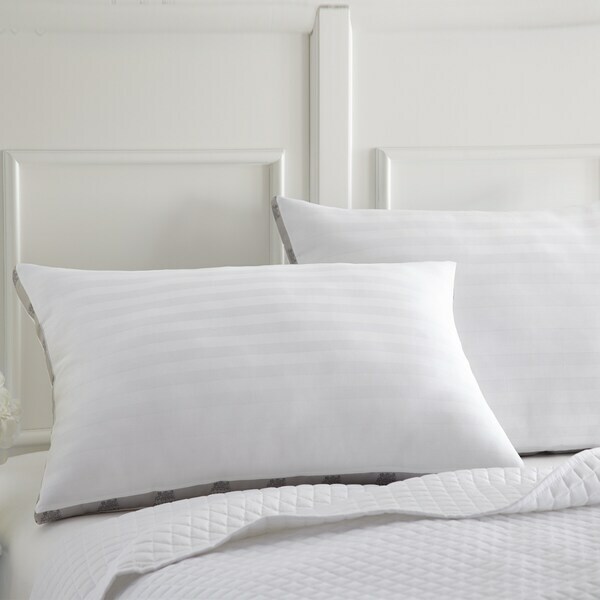 Each 500-thread count cotton pillow is filled with supportive polyester to keep you comfortable all night long. The classic white-striped pillows are machine washable for easy upkeep. When I first received these pillows, I thought they weren't going to last or be comfortable but these turned out to be the some of the best, softest, most comfortable pillows ever. If you are looking for firm pillows these are not for you. These are soft like we visualize clouds to be. Amrapur Overseas cotton Dobby down pillows. I ordered these pillows in king size. They are true to size fitting perfectly. they are very soft and i'm pleased with this purchase. They do take a couple of days to fluff up completely. I do wish they were thicker, but differently a good buy. I ordered these pillows because I have a thing for a zillion pillows on my bed and these looked cozy. When they arrived I wasn't so sure about them as they appeared kind of flat. They do fill out after about 24 hours, but not "high loft" by any means. They are cozy,but do allow your head to kind of sink into them. This worked well for me because my other pillows are a bit more firm, just not thick enough to support me as I'm a side sleeper. My original pillows along with the Amraupur pillows provide just the right amount of loft for my head to rest comfortably while sleeping on my side. Happy I made the purchase ! These are very comfortable and wash well. Didn't like the way my feet caught on the threads in the stripes. These pillows are amazing! They come vacuum sealed but fluff up fairly quickly. They get quite large, fluffy and are super soft but supportive enough so you don’t sink in, and eventually ending up pretty much flat on the bed like other pillows I’ve used. Feels like sleeping on a cloud. I’ve been on a life long hunt for a soft, huggable pillow that doesn’t go flat, or end up around my head instead of under it nor is too heavy, hard, or stiff (lol). I’m glad I didn’t give up because these pillows are just what I’ve been looking for!! Will be ordering more! I've purchased a few sets of these sheets and have not been disappointed. They fit the mattress well and are very soft to sleep on. I am pleased with the color and fabric they are made with. So far the sheets have washed well and I am happy that I purchased a few sets for our bedrooms. Ordered these to have a set of "softer" non-feather pillows for our spare room and these fit the bill. I missed the part where it said "jumbo" so they are wider than I thought they would be but that is on me. I can still fit them in my queen pillow cases. They come vacuum sealed flat but plump up nicely. I checked Target, Kohl's and even Costco before I purchased these and the pricing is better @ Overtsock for similar products. These pillows are comfortable and are easy to care for!! And they pretty much keep their shape! Love these pillows. Very comfortable! Great pillows and price. Best for pillow shams. Nice and fluffy, well made. Soooo comfortable and supporting for a good nights rest - not to mention I have chronic back and neck pain. They seemed a little “too fluffy” at first but when i slept on them I immediately felt the difference and my neck and back did not hurt as bad as they usually did. Perfect size and comfort for myself and for my fiancée. These are definitely worth the purchase. Oh my goodness!! I love these pillows. They are incredibly soft and comfortable. They arrived wrapped in plastic and very flat. Taking them out and airing out for a day or two totally brings them back to life!! The jumbo size is perfect for the Euro shams. "Are they firm enough to hold up shams nice and high without slouching?" Yes they are holding up nicely though I have only had them for about 2 months. No, they are not firm, so tend to slouch a tad. "Is the fill one big piece or small chunks?"